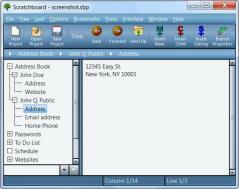 Scratchboard is a powerful piece of software that enables you to group and store all types of data in an encrypted file. The data is organized as a tree-like structure so you will be able to easily find and extract the items you need. A new database can be password protected, plus you can set Scratchboard to keep a log of all changes and backup your current project. Data can be exported and imported to and from XML documents and you can save just the currently selected branch or the whole tree. The information you enter in your database is organized in a tree-like structure with as many branches as needed. Furthermore, the application also comes with a text editor which allows you to insert and personalize content, as well as use tools such as a calculator, calendar, spell checker, and character map among others. Manage a large number of collections in a simple way. Allows you to keep, use, and backup all your information in one app.